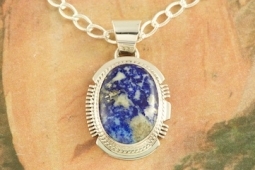 Genuine Lapis Diopside set in Sterling Silver Pendant. Created by Navajo Artist Larson Lee. Signed by the artist. Mother Nature is amazing. The matrix ( the pattern ) in this stone is all natural. No two stones are alike. Pendant is 1 1/4" long including bale x 3/4" wide.